이 그림은 조선조 후기 아미타설법도상의 규범이 되며 또한 17세기와 다른 18세기 초반의 화풍 경향을 잘 보여주고 있어 불교회화사의 중요한 자료이다. 1713년 도익(道益) 등이 조성한 아미타불화로서, 본존 아미타불을 중심으로 좌우에 10보살과 범천, 제석천, 10대제자, 벽지불, 사천왕, 팔금강 등을 배치하였다. 다른 불화에 비해 본존의 비중을 작게 함으로서 다수의 권속들을 표현함에도 불구하고 안정적이면서도 답답하지 않은 화면을 구성하였다. 원만한 상호묘사와 균형 잡힌 신체묘사, 유려한 필치, 금니의 화문 등 동일한 화승이 제작한 1731년 수다사 영산회상도 및 삼장보살도와 유사한 특징을 보여준다. 18세기 전반 경상북도 지역 불화의 특징이 잘 표현된 작품이다. This painting which served as a model for other late Joseon paintings on the theme of Amitabha Buddha in sermon is also of interest for insights if offers into the Buddhist painting style of the early 18th century. 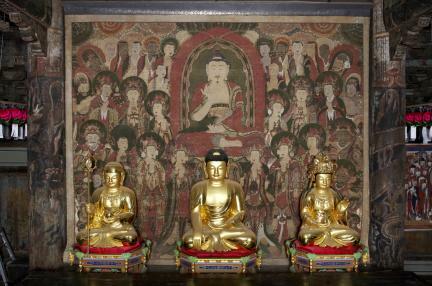 The Amitabha Buddha painting was created in 1713 by a group of monk painters including Doik. Amitabha, the main Buddha, is represented here in the company of ten Bodhisattvas, Brahma, Indra, the Ten Disciples, pratyekabuddha, the Four Guardian Kings and the Eight Vajras. The size of the main Buddha is not disproportionately larger than that of the members of his retinue, as is often the case in other Buddhist paintings. Thanks to this, the painting, even though it features a large group of figures, does not feel imbalanced or overly crowded. The faces of the figures appear good-natured and charitable, and their bodies well-proportioned. These characteristics, along with the elegant brushwork and gold-painted ornamental floral motifs, remind of the Painting of the Vulture Peak Assembly and the Painting of Three Bodhisattvas of Sudasa Temple, painted in 1731, by the same painter. This work faithfully reflects the characteristics of early 18th century Buddhist paintings from the Gyeongsangbuk-do area.